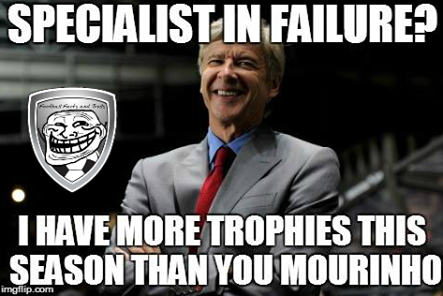 The Dissolution of the Empty Trophy Cabinet Curse. So over the weekend something amazing happened, the “Drought” clock has been reset. ARSENAL WON THE F.A. CUP!!! 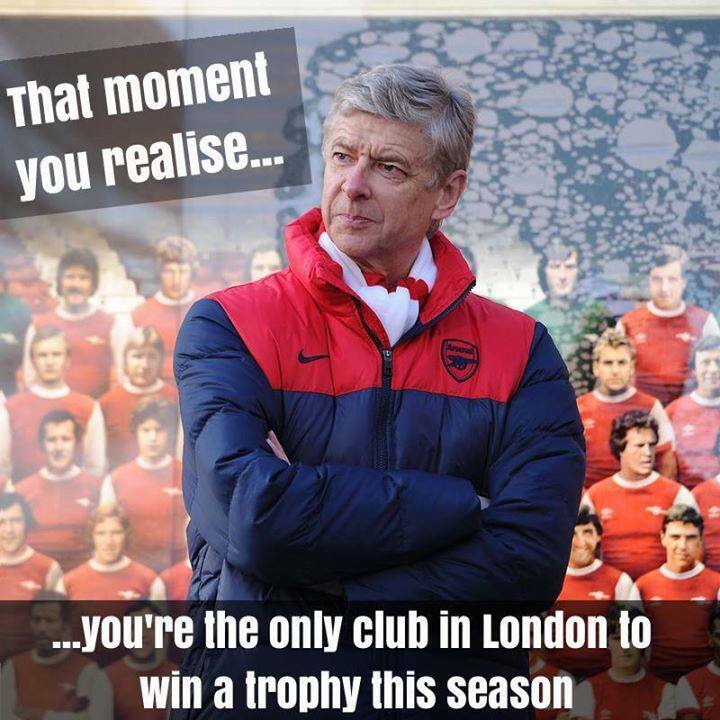 It was a long time since Arsenal won silverware, something in the region of 3283 days. 8 years of hopes being raised and crushed as Arsenal fans witnessed 3 years ago in the Carling Cup. We all knew that we just needed them to win their first cup, to add that first piece of silverware to the cabinet of our glorious new stadium to get the ball rolling again, to get these players to feel that which winners feel as they lift the trophy and dance through the city in a parade of joy with the fans. Now that they’ve got a taste of it, I’m sure they’ll be hungry for much much more. The celebrations were something very new to me, i’ve been a proper supporter since 2006, there first final i watched was the heart wrenching champion league one in 2006, and so i’ve never watched my team lift a trophy and bask in the glory of victory, and it felt wonderful, a little alien, but wonderful. “My first time watching my team lift a major trophy. This is an amazing feeling. Quite poetic that the last trophy we won was the FA cup and only to end the drought with the FA Cup. Words cannot fully express this moment. The match was insane, 2-0 down in 8 minutes to win it 3-2. The FA Cupis truly a mad affair. So glad to have watched this man end his trophy drought and vindicate himself. So happy to watch this team gel and proof themselves. a season that finally saw the return on investment on the Emirates Stadium with a substantial increase in sponsorship revenue, hence a stronger and self-sustainable financial position. The fact that it was Sagna’s last year on contract, Arsenal’s most loyal player in a while and he off all people deserved it. So many reasons, and it did in fact happen. And most of all, Gone are the “new empty dusty trophy cabinet jokes”. Now that pressure will lie elsewhere, i think it’s now on Liverpool if i’m not mistaken, think their last major trophy was also the FA Cup but in 2006, actually i think i’m mistaken. I think they won the League Cup in 2012. 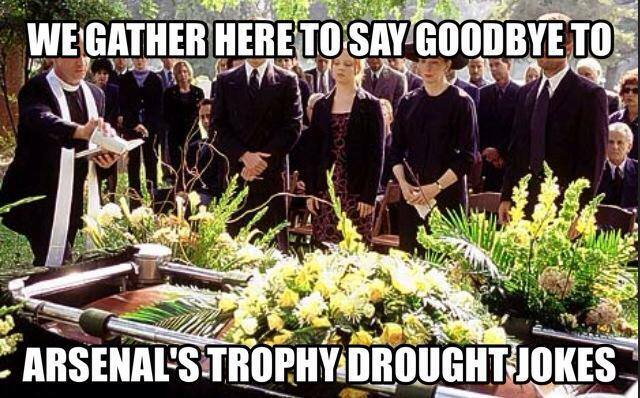 Hmm, so now that Arsenal’s 8 year drought is over, what will not constitute a trophy drought? Will it now be anything more than 2-3 years? That however is an issue for another time, I’m just relishing the fact that Chelsea’s “Special One” won absolutely nothing this season, a season in which many, many Blues fans were claiming was going to be his glorious return. Oh how great it would be if Eto’o come over to Arsenal, just to stick to Jose even more, but in any case I’m a happy camper. 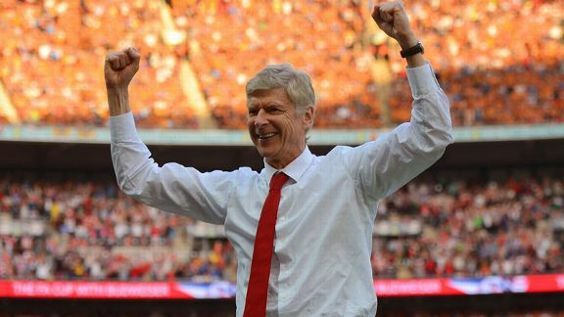 Arsenal won the FA Cup.